If you’re looking for a quick, easy and delicious entrée, nothing is quite as simple and tasty as a perfectly pan-fried piece of halibut. Not only is this popular white fish meaty enough to fulfill even the heartiest of appetites, but its tender texture also makes it the perfect go-to fish for pan-frying. Pan-frying halibut works with boneless fillets or halibut steaks, which still have the bone in. To avoid halibut that will stick and fall apart in the pan, starting with dry fish is key. To pull moisture out of your halibut, put your fillets on a plate, and leave them uncovered in the fridge to dry out for 30 minutes to an hour. If you’re short on time and want to simply get to it, you can just pat the halibut dry with paper towels. 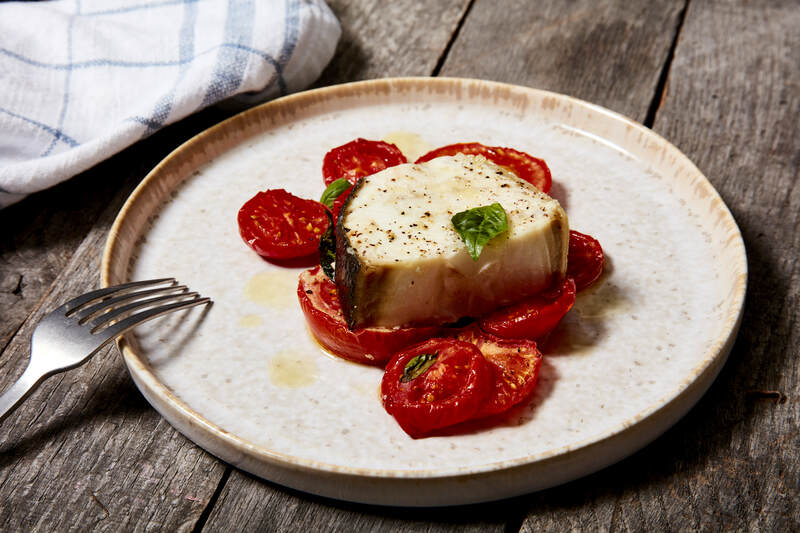 Since halibut is so versatile, you can season the fish to your liking, whether its salt and pepper to taste, or soaking the fillets in egg and dusting the fillets with flour (or alternatives such as almond or coconut flour) to add an extra crispy layer. Choosing the right pan is crucial to getting the proper sear on your fish. Though it’s tempting to opt for a non-stick pan to ensure that your fish does not stick, doing so will often result in less than crispy skin, so instead choose a cast iron, stainless steel or aluminum pan. Also, choose a large enough pan for the job, so the fillets (if you’re cooking more than one) aren’t crowded in the pan. Now that you have the right pan for the job, get it nice and hot (but not smoky) before adding your fish by letting it sit over medium-high heat for 1-2 minutes before you start cooking. Add one tablespoon of oil to the pan and hit both sides of each fillet with a decent amount of salt and pepper. Once the oil is shimmering, carefully lay a fillet skin side down in the pan pressing lightly on the fish with a spatula to keep it flat in the pan while it is cooking. Overcooking is the most common mistake made when cooking fish. Also, keep in mind that fish continues to cook after you have removed it from the heat, so pulling it earlier than you think is wise. To achieve a perfectly pan-fried piece of halibut, sear the fish for 3-5 minutes. Next, flip the halibut and add 2 tablespoons of butter, spooning the butter over the halibut as it cooks for another 5 minutes or so (keep an eye on it, though, because cooking time will vary depending on thickness of fillet or steak). To add extra flavor to your, you can add a dash of lemon and herbs such as dill and tarragon when adding the butter during cooking. You’ll know when your halibut is done when it has a golden brown crispy skin and springs back to touch. It should also flake easily with a fork. Drain briefly on paper toweling and you’re ready to transfer your pan-fried halibut to dinner plates. Since halibut has a delicate flavor, it works well with lots of flavor profiles. Braised leeks marinated in chicken broth, white wine vinegar, butter, and herbs add an elegant addition to halibut, as per this recipe. Or for a fresher side dish, mango-avocado salad atop of your halibut fillets is the perfect combination for a light lunch.